MIDDLEBURG HEIGHTS, Ohio, November 2, 2018	(Newswire.com) - ​​​​​Fidato Wealth, a Middleburg Heights, Ohio Registered Investment Advisor, has been named to Financial Advisor magazine’s Top RIA Rankings for the second year in a row. The 2018 list was recently published by this respected financial services industry magazine. Founded by CEO and Senior Wealth Advisor, Tony D’Amico, CFP®, Fidato Wealth is an independent, fee-based financial advisory firm that provides comprehensive financial planning and wealth management for a select group of successful families, individuals and professionals. The ranking is based on assets under management and comprises more than 600 firms. To be eligible, firms must be registered investment advisors and provide financial planning services to individual clients. Fidato Wealth was particularly noteworthy, receiving back-to-back rankings on the list, for achieving a 53.7% and 45.25% growth rate in 2016 and 2017, respectively. By limiting our practice to a select group of families and business owners with whom we can have a huge impact, we are attracting potential clients with more complex financial planning needs in our area and surrounding communities. By utilizing a comprehensive process to help our clients address each of their four key concerns: making smart decisions about their money, mitigating their taxes, protecting their wealth, and taking care of their family and heirs -we help them align their resources with their values and what is important to them in their lives. “As a truly independent firm, our goal is to help our clients achieve the greatest degree of financial reliability and prosperity in accomplishing their financial and life goals. The fact that we work closely with a network of professional advisors such as Certified Public Accountants, estate lawyers and Risk Management specialists who help maximize the probability of achieving their goals is very attractive to our clients,” added D’Amico. Fidato Wealth is a fiduciary-based Wealth Management firm, headquartered in Middleburg Heights, OH, that provides comprehensive financial planning for successful families and business owners. 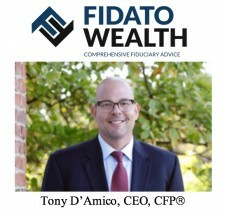 Tony D'Amico, CFP®, CEO and Senior Wealth Advisor, has been quoted in Wall Street Journal, CNBC, Barron’s and other national publications. Fidato Wealth was named to Financial Advisor magazine’s Top RIA Ranking list in both 2017 and 2018. For more information, please visit http://www.fidatowealth.com/. Fidato Wealth LLC is an SEC Registered Investment Adviser. Advisory services are only offered to clients or prospective clients where Fidato Wealth LLC and its representatives are properly licensed or exempt from licensure. Past performance is no guarantee of future returns. Investing involves risk and possible loss of principal capital. No advice may be rendered by Fidato Wealth LLC unless a client service agreement is in place.